A judge ruled Friday that longtime Rep. John Conyers, D-Mich., can appear on the August primary ballot. State election officials announced earlier in the day that Conyers had failed to collect the number of valid signatures necessary for his name to appear on the ballot. The Michigan Secretary of State’s office confirmed an earlier finding that some people who had gathered signatures for Conyers were not registered to vote, thus invalidating them. But Detroit federal Judge Matthew Leitman reversed that determination and issued an injunction that Conyers' name be on the ballot. 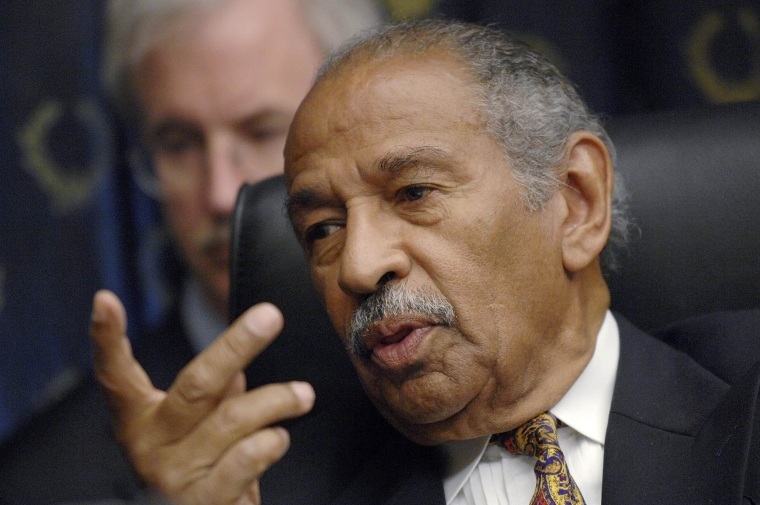 “As Secretary Johnson implicitly acknowledged in her ruling today, if the signatures excluded pursuant to the Registration Statute may not be excluded from Mr. Conyers’ total — and this Court holds that they may not be — then Mr. Conyers has enough signatures to qualify for placement on the ballot,” Leitman wrote, "He shall be placed on the ballot." Conyers is running for a 26th term in Congress, and if he goes on to win in November, he would become the longest serving current member of the House of Representatives, giving him the "Dean" title that Rep John Dingell, D-Mich., is giving up after her retires at the end of this term.